RVupgrades Blog: Are Towing Mirrors Really Necessary? So you just picked up your first camping trailer, which is a major purchase, and now the budget is limited on accessories needed. Depending on whether you have friends or family who are campers probably depends on how long that list of RV accessories has become. While convenience items are always more attractive to have, you really need to look at some of the safety items first such as towing mirrors. Since some vehicles, specifically larger pickup trucks that are designed with towing in mind, come with larger mirrors that extend further away from the vehicle, many smaller vehicles that are equipped for towing do not have these larger mirrors. In this situation, it is important to evaluate the need to add towing mirrors. These mirrors can provide the visibility you require without making permanent changes to your towing vehicle. But do you really need to purchase these special mirrors for your situation? 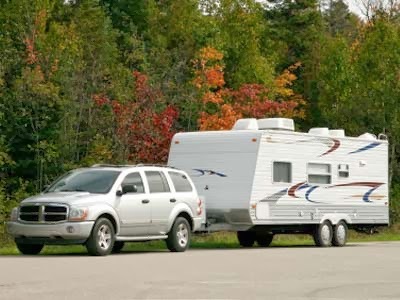 If your visibility is reduced due to the size of your trailer versus the size of your vehicle, the addition of towing mirrors is always recommended. When driving on the freeway or in other city environments, it is imperative to have a clear view before you change lanes, turn corners or enter or leave a parking lot. Most standard vehicle mirrors will not show you as much area as specialty mirrors. However, it is important to remember that even specialty mirrors will still have blind spots. Many states have laws about the use of towing mirrors on tow vehicles. When you purchase your trailer, do your research so you know what the laws are in your state. However, if you intend to travel to other areas of the country, it is also important to check the laws in the areas to which you will travel. In most cases, it is simply better to buy the mirrors so you don't find yourself in a situation where you don't have what you need. Nothing ruins a vacation faster than a ticket you could have avoided. In some situations, your tow vehicle may already have mirrors that don't need to be extended based on your trailer size. Before you go, it is important to complete an easy check to determine if you need the mirrors. Measure from the inside of the driver's side mirror to the inside of the passenger side mirror through the vehicle. Measure from the outside of one mirror to the outside of the other. Measure the width of your trailer. Be sure to include any elements, such as the awning rails, that protrude from the side in your measurements. If your trailer width is less than the first measurement, you don't need mirrors. However, if it is between the two measurements or greater than the second measurement, you are more likely to need mirror extensions. Towing mirrors may seem like an unnecessary expense, but it can be one that makes your driving conditions safer. In some situations, it may even be illegal to tow a trailer without installing them on your vehicle. The good news is you don't have to spend a lot on purchasing these mirrors, and many of them are temporary additions to your vehicle that can be added and removed without damage. If you are looking for towing mirrors to add to your tow vehicle, visit our tow mirror section or contact us. We offer a great selection of mirrors so you can find the right options for your vehicle and trailer.